A politically created crisis of epic proportions is brewing in California and elsewhere across the United States. For decades, public pension officials and politicians of both parties have promised their employees increasingly generous retirement benefitswhile low-balling the contributions from government agencies and employees that are needed to cover these promisespresenting our greatest financial challenge since the Great Depression. Pushing the pension liability from today and onto our children and grandchildren leaves them with a depleted future and a potentially bankrupt California. State and local governments will scramble to find funds, forcing them to raise taxes, slash public services, and/or declare bankruptcy. Schools, parks, emergency services, and public-employee retirement benefits will be at risk. Politicians will defer until circumstances force them to reckon with a disaster of their own making. The problem? For far too long, state and local governments have promised their employees increasingly generous retirement benefitsbut without ensuring that sufficient funds will be on hand when the pension payments come due. In California Dreaming, Lawrence J. McQuillan pulls back the curtains covering this unfunded liability crisis. He describes the true extent of the problem, explains the critical factors that are driving public pension debt sky-high, and exposes the perverse incentives of lawmakers and pension officials that reward them for not fixing the problem and letting it escalate. Finally, he offers the six crucial reforms needed to restore the financial health of California and other threatened jurisdictions. If California Dreamings roadmap for reform is adopted, the prospects for achieving a thriving, balanced and equitable future are highly favorable in California and any state or municipality facing its own public pension problem. If not, the many opportunities that once made the Golden State seem like a Promised Land will quickly evaporate. 1 How Are Defined-Benefit Pensions Calculated? 2 How Are Pension Funds Amassed? 4 What Are the Major Drivers of the Pension Problem? 5 Why Did Lawmakers Allow This Problem to Worsen and Why Have They Not Solved It? 7 Why Offer Pensions at All? Californias public pension crisis is the greatest financial challenge the state has faced since the Great Depression. Independent experts estimate that state, county, and city governments will collectively be able to meet only 51 percent of their total pension obligations. The predicted $576 billion shortfall threatens to seriously disrupt public services such as schools, roads, parks, libraries, police, and fire departments; slash pension payouts to millions of public retirees; hurt the investment portfolios of bondholders; trash the credit ratings and borrowing capabilities of state and local governments; and impose huge tax burdens on current taxpayers and future generations. Politicians of both parties, as well as opportunistic special interests, helped create Californias impending public pension tsunami. The states unfunded pension liabilities have swelled to unprecedented size due to a combination of generous pension benefits, rosy investment assumptions, politically motivated underfunding, and deliberate misinformation by pension officials. Each year, the equivalent of 18 percent of the state budget is spent on the three largest public pension funds: the California Public Employees Retirement System (CalPERS), the California State Teachers Retirement System (Cal- STRS), and the University of California Retirement Plan (UCRP). Although the financially troubled plans claim they can meet 79 percent of their pension promises, even this admission is incomplete; realistic estimates show they can barely cover one half. Although California is heading toward a fiscal cliff , a handful of reforms would permanently fix the public pension problem. They are: (1) require financial transparency and sound actuarial assumptions; (2) require full annual funding of each pension plan without the issuance of pension obligation bonds; (3) give state and local governments the flexibility to switch to sustainable defined-contribution pensions for all public employees; and (4) require voters to pre-approve any pension-plan change that increases financial obligations. Together, these reforms would cap the pension debt, pay all earned pension benefits, limit the intergenerational transfer of pension burdens, better protect public services, and provide pension benefits going forward that are aff ordable and comparable with those offered in the private sector. California is not the only state with massive public pension debt and pension costs that are devouring government services. Similar problems confront Connecticut, Florida, Illinois, New Jersey, New York, Ohio, Pennsylvania, West Virginia, and other states. And cities such as Chicago, Los Angeles, New York, and Philadelphia face their own local pension crises. 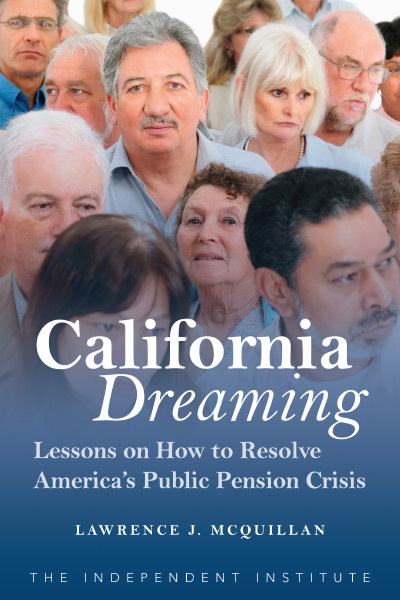 California Dreaming provides a blueprint for America on how to measure the true extent of a pension problem, identify the political drivers of a crisis, and make strong fiscal and moral arguments for the pension reforms needed to permanently fix the problem. The methods and hard lessons learned in the Golden State can be applied anywhere in America. A crisis of epic proportions is brewing in California and elsewhere in the United States, a politically created crisis that threatens to inflict harm on countless residents and retirees: a drastic shortfall between public pension promises and the assets needed to make good on those promises. Public pension plans are supposed to be financed by contributions from government agencies and their employees, with those funds invested in profitable assets that enable the plans to pay the promised benefits for 20, 30, or 40 years after the employees retire. In California, however, pension officials and politicians of both political parties deliberately lowballed the contributions and increased the promised benefits to such an extent that the plans wont be able to cover all of their pension liabilities. When the day of reckoning comes, taxpayers will be on the hook to make up the diff erence between pension promises and pension assets. In California Dreaming: Lessons on How to Resolve Americas Public Pension Crisis, economist Lawrence J. McQuillan (Senior Fellow, The Independent Institute) pulls back the curtains covering the unfunded liability disaster. After describing the true extent of the problem, McQuillan focuses on the critical policy actions that drove Californias public pension debt sky-high. He also examines a more fundamental problem: the perverse incentives of lawmakers and pension officials that reward them for not fixing the problem and letting it escalate. Finally, he examines the immorality of the crisis, the crucial reforms needed to fix the problem, and the long-term benefits of a permanent solution. If reformers heed the analysis and proposals presented in California Dreaming, the prospects for achieving a balanced and equitable resolution are favorable, in California and in any state or municipality struggling with its own public pension problem. If not, many opportunities that once made the Golden State seem like a Promised Land will quickly evaporate. California has 86 defined-benefit public pension plans with about 4 million members, or roughly 11 percent of the states population. Its state and local government employees receive defined-benefit pensions that guarantee specific monthly payments to retirees for life. The monthly checks are calculated based on final compensation, age at retirement, the number of years of service, and any cost-ofliving adjustments. State and local government public pension plans say they need $158 billion more in assets today to make good on their pension promises. According to McQuillan, however, official measures of funding status are seriously flawed, and correct assessments reveal that Californias public pension systems are in much worse health than officially reported. When measured correctly, unfunded public pension liabilities in the state are nearly four times as large as official government estimates, reaching a staggering $576 billion or nearly $15,000 per Californian. McQuillan examines the history of Californias Big Three public pension plans and identifies the critical policy actions that drove the pension debt sky-high. The history lesson shows that the unfunded liabilities are selfinfl icted, and not primarily due to the Great Recession. Most of the critical drivers of the crisis were set in motion long before 2008. Poor public governance, not macroeconomic troubles, drove the severe financial problems. Four variables aff ect the health of any defined-benefit pension plan: (1) employer contribution amounts, (2) employee contribution amounts, (3) investment returns, and (4) promised benefits. McQuillan shows that in each area, reckless decisions by politicians and pension officials drove unfunded liabilities to unsustainable levels, and macroeconomic developments amplified the poor decisions. The critical drivers include: funding pension systems below the annually required levels; providing contribution holidays and pension pickups; increasing the riskiness of investment portfolios over time; setting unrealistically high actuarial rates of return and discount rates; underestimating the life expectancy of pensioners; miscalculating government workers retirement dates; giving more-generous benefits through formula enhancements, COLAs, and skimming; lowering the minimum age of retirement; allowing retroactive application of more generous benefit formulas; and unleashing bidding among government agencies using pension benefits to lure new employees. According to a leading study, California state workers receive government pensions about 30 percent larger than their privatesector counterparts. McQuillan explains that perverse incentives of lawmakers and pension officials encourage unfunded liabilities to escalate over time. These harmful incentives exist in any jurisdiction with public governance of defined-benefit pension plans. Elected officials know pension recipients and their families are more likely to vote for them if they increase pension benefits. Lawmakers seek votes and campaign contributions by pandering to special interests with higher pension benefits. Also, many voters and taxpayers are happy to receive public services without paying the full cost, meaning the cost that includes the public employee pension costs. Pensions are particularly well suited for vote buying because the full costs of higher pensions are not realized initiallythe pension tsunami takes years, if not decades, to swell. Lawmakers can make pension promises today, and the full cost is pushed into the future, usually after the legislators have left office. California lawmakers also promised generous pension benefits, but contributed little money up front because they assumed the contributions would earn a high rate of return for decades when invested. The Big Three assume that they will outperform the average portfolio return in the twentieth century by 21 percent every year forever. This risky approach frees up money to be spent on other programs, but it is a collapsing house of cards when reality does not match the politically motivated rosy assumptions. McQuillan shows that both Democrats and Republicans played the pension game because, ironically, these reckless decisions advanced politicians short-term interests. Perverse incentives motivate politicians to blow a hole in defined-benefit pension plans. McQuillan explains that the failure to fully fund the pension promises has allowed the current generation to receive public services that they did not fully pay for, pushing the pension problem onto future generations. This approach to pension funding produces massive intergenerational inequity, treating our children and grandchildren as piggy banks. The unwillingness to confront the true scope of Californias pension costs, to pay for the promises made, and to make changes to control future obligations means these costs are pushed onto our children and grandchildren who are forced to pay for promises they did not make and for services they did not agree to. The injustice is apparent to anyone who cares to see. Future generations will have to forego government services that their parents and grandparents enjoyed, such as police and fire protection, library services, and education, in order to pay for past pension promises they didnt consent to. This service-delivery insolvency is as real as financial insolvency. Skyrocketing public pension costs are crowding out spending on other public services. Left unchanged, the financial burden of the pension problem will crush our children and grandchildren, leaving them with a depleted future and a depleted California. The responsibility to fix this problem is as great as any moral imperative because it directly impacts the quality of life our children will enjoy and their chances for upward mobility. A true solution to Californias public pension crisis must do two things: (1) shore up Californias current public pension plans, and (2) ensure that California never repeats this crisis. McQuillan offers six reforms that would solve Californias pension problem in an equitable, responsible, and moral way by preserving pension benefits already earned; allowing governments, if they choose, to provide competitive defined-contribution pensions going forward to all employees; and granting governments the flexibility needed, so that future generations are not paying for deals they did not make. These reforms could be applied anywhere in America facing a similar problem. The specific recommendationsmost of them already in place in the private sector would require financial transparency and full annual funding of each pension plan without issuing pension obligation bonds. Also, the reforms would give state and local governments the flexibility to switch to sustainable 401(k)-style defined-contribution pension plans going forward for all government employees. Voters would also be required to pre-approve any pension plan change that increases financial obligations. These reforms are the crucial elements of a comprehensive solution. They would stop the problem from getting worse, fully fund the pension plans without severe hardships on future generations, and guarantee that the crisis is never repeated. The reforms presented in California Dreaming would provide significant fiscal benefits for consumers of government services, public employees and retirees, taxpayers, voters, legislators, younger people, and poorer people. For example, McQuillan shows that by freezing the Big Threes defined-benefit plans and switching to defined-contribution plans, California could save at least $6 billion a year, which would pay for the closure of the defined-benefit plans over about 30 years, if the governments actuarial scenario proves to be correct. The $6 billion annual savings would make a significant contribution toward paying down past pension debt (in other words, paying for all earned pension benefits) while capping the debt, limiting the intergenerational transfer of burdens, better protecting public services, and providing pension benefits going forward that are competitive with those offered in the private sector. Once the pension debt is paid, the tremendous savings could be redirected to restoring public services, such as education, police and fire protection, libraries, and roads and bridges, or it could be refunded to taxpayers for their own retirement savings. Without the reforms, pension burdens will be crushing, growing, and repeatable. McQuillan also explains that current and future government retirees, in particular, would be wise to accept the recommended reforms because the changes would fully pay for accrued benefits and decouple future retirement benefits from government treasuries, which are increasingly teetering on bankruptcy or already insolvent. Recent federal bankruptcy court decisions in both the Detroit and Stockton municipal bankruptcies ruled that pension checks of current and future city retirees may be cut in bankruptcy proceedings. Both cities were driven into bankruptcy by unaffordable pension obligations. Defined-contribution pensions would untether retirement security from the future financial health of municipal governments. "California Dreaming: Lessons on How to Resolve America's Public Pension Crisis is a wake-up call about a simmering crisis in California and the United States. As the baby boomer generation grows older and retires, increasingly government pensions and retirement benefits are a rising cost that threatens to force state and local governments to raise taxes, slash public services, declare bankruptcy, or all three. California Dreaming examines the extent of the problem, the causes that are forcing public pension debt to unprecedented levels, and lists six critical reforms needed to bring financial stability to California and other jurisdictions in trouble. Accessible to readers of all backgrounds, California Dreaming is a 'must-have' for policy makers and public and college library Economic Studies shelves."